Much like Michael Kors watches or Mulberry handbags, Raybans have a status as 'it' sunglasses - an iconic accessorie that most people would like to add to their collection! I have to admit, I was one of those people and for as long as I can remember, a pair of aviator Raybans had been on my never ending wishlist. I think my love for them began after visiting my dad and stepmum in Australia as they both own multiple pairs and look amazing whilst wearing them. Its obviously very sunny all year round in Australia so they could justify the purchase but for me who lives in the dreary UK, spending over £100 on sunglasses just wasn't feasible - especially as I'd only get to wear them for a few weeks of the year. With this being said, you can imagine my excitement when The Sunglasses Shop contacted me asking if I'd like to receive a pair and give some away on my blog. Of course I jumped at the chance - who wouldn't? My dreamy aviator Raybans arrived in the post a few days later and it was love at first sight. From the brown leather protective case to the signature Rayban logo, I was in love with them. 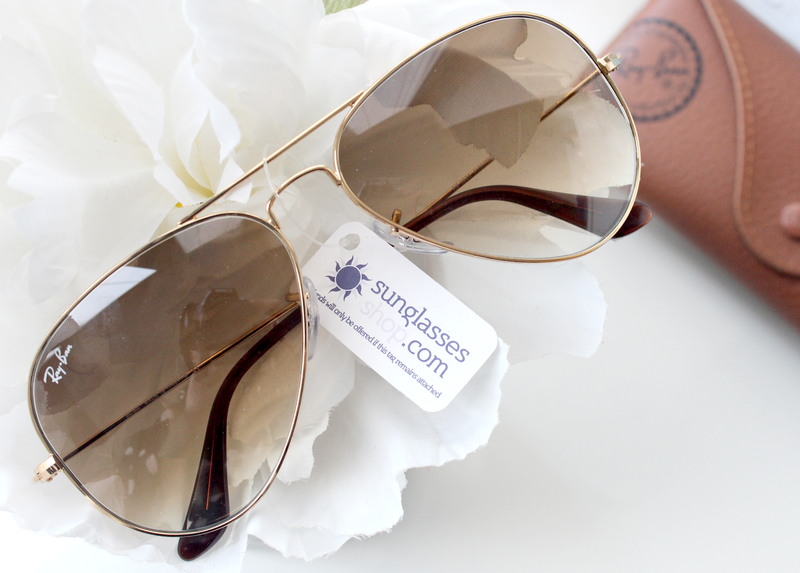 Now if you love Raybans as much as I do and would like to be packing a pair to take away on your Summer holiday, all you need to do is enter my giveaway via the Rafflecopter widget below. The Sunglasses Shop have a huge array of Raybans on their website so there should be a pair to suit your own personal style! There's a price limit of £120 but that covers almost all of the Raybans anyway so it shouldn't be an issue. There's a few mandatory entries on the Rafflecopter widget below such as liking The Sunglasses Shop's Facebook page and following me on Bloglovin' and also a few extra entry options if you want to boost your chance of winning this fab prize! 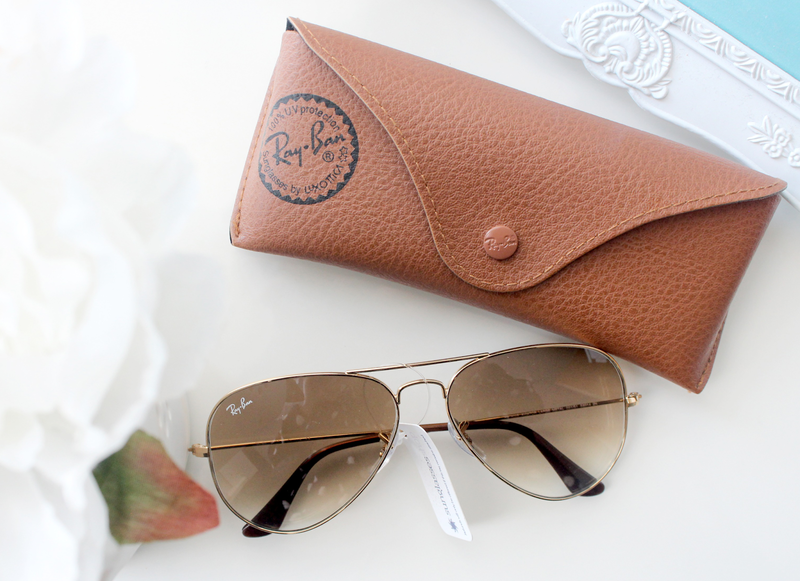 It would be so exciting to own a pair of RayBans! I absolutely love this compeition, I have wanted a pair of Raybans for about 5 years now, I keep putting them on my birthday and Christmas list but they never appear lol! 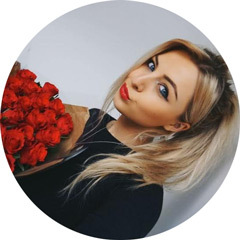 The ones you chose are gorgeous and look so beautiful! What are they called? A new pair of sunglasses is just what I need! Admired Rayban's from afar! Great giveaway! Have wanted some Ray Bans for a long time! Awesome giveaway! Oooooo i think we all love a good giveaway! And this one is just ohmygod so good!!!!! So excited!! Great giveaway! I absolutely love Raybans. They're so timeless. ty ty ty sooooo much for this AMAZING GIVEAWAY!!!! I just lost my J.Crew sunglasses I bought on clearance a few months ago for $14.99 & a case I had bought at Forever 21 durung Christmas that I LOVED,I cannot find them anywhere, lost them over Memorial Day weekend ...So , I wd b so over the moon happy to win these, I wd NEVER EVER b able to afford a pair of these, always wanted a pair, but a girl can drea...ty again have an awesome weekend!!! Thanks for the opportunity! Back in the 80's I had Ray Bans (yeppers I am old LOL) and need a pair bad!